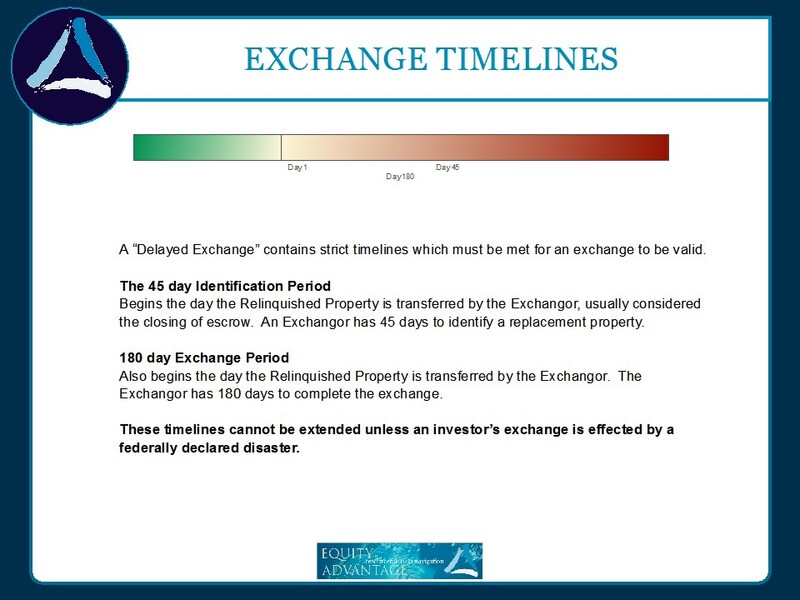 David Moore with Equity Advantage Incorporated speaks on exchange timelines and what to expect when dealing with 1031 exchange timelines, properties and 1031 exchange financing! From the first transfer date you’ve got 45 days to identify what you’d like to acquire, and then you have a total of 180 days to receive one or more of those properties. It’s not 45 days and then 180 on top, it’s a total of 180 days. And if you read the fine print of the code, it says 180 days or the due date of your tax return. At this time of the year we start thinking about 180 days and it’s starting to get us close to or beyond April 15th. So we’ve got to look at what’s happening here. It has only happened once to my knowledge in 26 years, but I had a broker that we do lots of deals with and his partner was an overachiever who filed the tax return in January… most of my clients don’t do that and that sunk ’em. As soon as they filed the return that was it. So, if you are talking about getting things done and you’re looking down the road at that April 15th date, and the exchange isn’t going to be done, just file an extension. My client’s got a friend in Texas who’s gonna sell a house, and he wants me to buy a duplex in Bali. But she likes nice stuff, so he said, well, I’ll find something that’s a wreck ’cause I flip anyway, I’ll buy it, fix it, and then sell it to her. So I said, ah, I guess you could do that. And I said, so where are you gonna get the money? He said, oh, she’ll just lend it to me ’cause she just lends me money all the time on all my fixes. Can they do that? I mean, if it’s not exchange money. If it’s money from outside, they’ve got a relationship preexisting. I probably wouldn’t want to have the money loaned to him the day that he buys the property, because that might look a little better to have a little distance there. But, you know, if it’s working within a hundred and eighty days, that person’s not really acting as an agent of hers necessarily. So getting the money from her, while she’s trying to sell in Texas, fixing up the property, and then probably sell it to them. Yes, so if that person’s not related to her, then I don’t really have a problem with that. We can do that, and it solves having to do an improvement exchange. So, 45 – 180, something to keep in mind, the bold at the bottom, there’s never been an extension on these things, ever until 9/11. Since then we have gotten a bunch of them this year with the storms down in Florida and Texas. So if you can document that you’ve been impacted by these events, any presidentially declared national disaster, you can get an extension on. If they ID something that was now nonexistent, or … any of those situations, you can now show that you were impacted by what happened.